Renowned airbrush artist Dennis Mathewson has created a line of mouldings and photo frames that just plain rock. Well known for his fine art painting, custom auto painting, and tattoo work Dennis has created designs that include tribal inspired patterns, shark teeth, barbed wire, skulls and more. Each of these motifs are intricately carved and distressed like a great pair of old Levis. His design studio in Hawaii, Cosmic Airbrush, has been churning out eye catching and award winning work for over 30 years. covered easel back and an attractive black gift box. Winged Love incorporates Skulls, Roses and Hearts in this fantasy design created by renowned artist, Dennis Mathewson! This antiqued silver finished photo frame is accented with a black outside edge. Available in 4x6, 5x7 - 1-1/4 inch wide and 8x10 frames - 1-3/4 inch wide. DM Dzigns by Dennis Matthewson Made in PRC - Imported to the USA by Direct Moulding, San Marcos, CA Finish: Silver & Black Velvet Easel backed / Includes attractive Black gift box. Click on Image to enlarge and see more detail! Nerves pulled in all directions - Stretch is a detailed fantasy design created by renowned artist, Dennis Mathewson! This antiqued silver finished photo frame is a full two inches wide. Available in 4x6, 5x7 and 8x10 frames - 2 inch wide profile DM Dzigns by Dennis Matthewson Made in PRC - Imported to the USA by Direct Moulding, San Marcos, CA Finish: Antiqued Silver Velvet Easel backed / Includes attractive Black gift box. Click on Image to enlarge and see more detail! The Jolly Roger plays on the infamous black flag of the Carribean incorporating the skull and cross bones in a fantasy design created by renowned artist, Dennis Mathewson! This antiqued silver finished photo frame incorporates a black interior lip and outside edge. 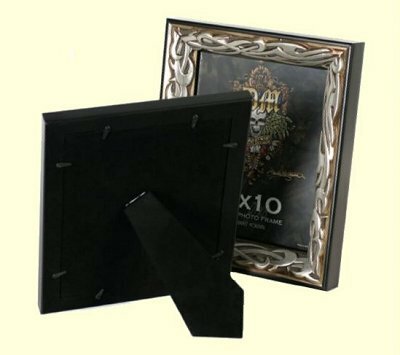 Available in 4x6, 5x7 and 8x10 frames - 1-1/8 inch wide profile DM Dzigns by Dennis Matthewson Made in PRC - Imported to the USA by Direct Moulding, San Marcos, CA Finish: Antiqued Silver and Black Velvet Easel backed / Includes attractive Black gift box. Click on Image to enlarge and see more detail! Sharks teeth may not be immediately apparent in this fantasy design created by renowned artist, Dennis Mathewson! This antiqued silver and ivory finished photo frame incorporates a black interior lip and outside edge. Available in 4x6, 5x7 and 8x10 frames - 1-3/4 inch wide profile DM Dzigns by Dennis Matthewson Made in PRC - Imported to the USA by Direct Moulding, San Marcos, CA Finish: Antiqued Ivory, Silver and Black Velvet Easel backed / Includes attractive Black gift box. Click on Image to enlarge and see more detail! What a fantastic Patriotic presentation of the Stars and Stripes in this fantasy design created by renowned artist, Dennis Mathewson! This photo frame is available in either an antiqued silver or a black and dark red finish. Available in 4x6, 5x7 and 8x10 frames - 1-1/4 inch wide profile DM Dzigns by Dennis Matthewson Made in PRC - Imported to the USA by Direct Moulding, San Marcos, CA Finish: Antiqued Silver or Black and Red Velvet Easel backed / Includes attractive Black gift box. Click on Image to enlarge and see more detail!